Love, friendship, and a dead Austro-Hungarian archduke add up to surprising and heart-changing conclusions in this ingeniously layered comic novel about reinventing oneself by Printz medalist John Green, acclaimed author of Looking for Alaska. When the need to read contemporary novels hit me, it stays and it stays until the need decides it’s satisfied. 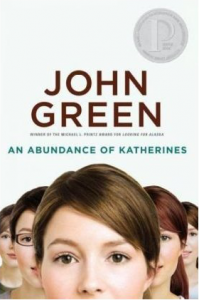 And what better book to fill that contemporary need than something written by John Green? I was really planning to read John Green’s books in order of publication, but Paper Towns had to come first due to an insistent friend and because I covered that with plastic first. I didn’t mind, although I was kind of wary thinking of how this book would fare against the rest, or how the other books would fare after I read this one, given the John Green formula. True to that formula, An Abundance of Katherines has the usual elements: a nerdy/loserish (by popularity’s standards)/socially awkward guy, a mysterious girl, a trusty and equally nerdy/loserish (by popularity’s standards)/socially awkward sidekick, and a car. But that’s when the similarities end, because this book is probably is indeed the funniest, quirkiest, and the happiest among all Green books. Colin Singleton is an anagram loving child prodigy who has only one friend and strangely a lot of girlfriends, all named Katherines. After he gets dumped by the 19th Katherine, he sets off on a road trip with his Lebanese friend, Hassan. The two find themselves in Gutshot, Tennessee, where they meet Hollis and Lindsey, and find a job gathering stories from locals for some project. Colin finds himself consumed by trying to prove his Theorem of Underlying Katherine Predictability, which would predict his relationship with the next Katherine, and along the way (just like the other John Green books), our hero finds out more about himself. The best thing about An Abundance of Katherines is how quirky the entire book is. It’s not just the characters or the story but how it was also written. Math geeks would definitely be happy about the Theorem of Underlying Katherine Predictability, with graphs and whatnot inside the book. I love the little footnotes on the pages that translates some of the words Colin and Hassan say, as well as little anecdotes about Colin and his own quirkiness. If you don’t like math, well, don’t worry either. I’m pretty sure you will still enjoy this book because you don’t really need math to understand the graphs or equations. You don’t really need to understand them, anyway, but if you’re like me who doesn’t really like math but want to understand things, there’s an appendix right at the end of the book that explains the equations and graphs. It reminds me a bit of analytic geometry in high school, but in a more fun scale. Why didn’t we have this book back then? Even if it’s a dumb story, telling it changes other people just the slightest little bit, just as living the story changes me. An infinitesimal change. And that infinitesimal change ripples outward – ever smaller but everlasting. I will get forgotten, but the stories will last. And so we all matter – maybe less than a lot, but always more than some. This really makes me wonder why I waited so long to read John Green’s books. But no matter, I’m glad I read them now. This makes me want to go to the book store and search for his works (namely Let It Snow, Geektastic, 21 Proms, and Will Grayson Will Grayson). More John Green over here, please. Funny, quirky, and happy – I agree. Those words really sum up this book. There’s nothing like John Green and if you love him, you eventually do have to read everything he’s written. So happy you liked this one. I thought it was hilarious and unique as well as having the profound-ness of Green’s other books. I was afraid that this one won’t be as deep as Looking for Alaska or Paper Towns, but I’m glad that it still had that depth. Green is a really good storyteller, and he definitely knows his nerds. :) Makes you wonder which among his main characters he is like the most: Colin, Q, or Pudge?